It's probably more news to report when Bob Dylan is NOT touring then when he does as it seems he is constantly on the road the last few years. Dylan has detailed a short U.S. tour for October and November that will hit such major cities as Las Vegas, Denver, Chicago, Detroit, Pittsburgh, New York and Boston. Fans should note that Dylan seems to have returned to more all encompassing shows. He recently was singing mostly songs from his three standards albums but a July show in Vancouver saw a well rounded set list that only had six standards among the twenty songs performed. 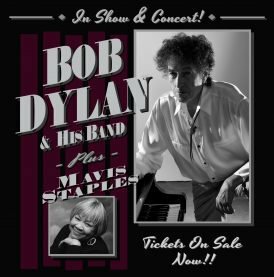 Joining Dylan for the tour will be Mavis Staples.